What’s your favorite food? Chances are, there’s a museum dedicated to it somewhere. You might want to include one or more of these museums in your next vacation road trip. Pearle Wait of LeRoy, New York, invented a fruit-flavored gelatin dessert in 1897 that he wife named Jell-O. Appropriately, the town is home to the Jell-O Gallery, a museum dedicated to the gelatin that took America by storm. Visitors will learn the history of Jell-O, see memorabilia and advertising from Jell-O history, and learn about cooking in the past century. The museums operated by the non-profit LeRoy Historical Society, and is not supported by Kraft/General Foods, which owns Jell-O. The museum is open seven days a week through December, and weekdays January through March. The Hormel company has its headquarters in Austin, Minnesota, a few miles south of Minneapolis. That’s also the home of the Spam Museum. Hormel opened a small company museum in the local mall in 1991, but quickly found that all their visitors cared about was Spam, so now that classic canned meat has its own building downtown. Exhibits include the history of Spam, cooking demonstrations, Spam memorabilia, and a soundtrack from Monty Python. In 2005, the International Banana Club Museum was named by the Guinness Book of World Records as the “most items devoted to any one fruit in the world.” The IBC Museum was established by Ken Bannister and the club in 1975, and amassed its collection of 17,000 banana items from club members who gained “banana merits.” The collection was sold in 2010 and is now the International Banana Museum. It is open Monday through Friday from 11 a.m. to 7:30 p.m.
Marion, Ohio, is the self-proclaimed Popcorn Capital of the World, due to the existence of the Wyandot Popcorn Company, which was based in the area since the 1930s. The company now focuses on chips, but its legacy is enshrined in the Wyandot Popcorn Museum, which boasts an extensive collection of restored antique popcorn poppers. These commercial poppers range from movie theater models to snack wagons to factory poppers, some over 100 years old. The museum shares space with the Wyandot Historical Society in the town’s historic former post office building. The museum is open Wednesday through Sunday, 1 to 4 p.m. through October, and weekends only the rest of the year. The National Dairy Shrine is a professional group formed in 1949 promote the milk industry. The National Dairy Shrine Museum is a place to learn about all facets of the dairy industry, from the history of midwest dairy farmers to the production of butter, ice cream, cheese, and other products. The Shrine also has educational programs, a Hall of Fame honoring leaders in the industry, scholarships and internships, and more. The museum is open Tuesday through Saturday from 9:30 a.m. to 4:30 p.m.
Barry Levenson was once Wisconsin’s Assistant Attorney General, but his real passion is mustard. He’s been collecting different mustards since 1986, and eventually left his law career completely to devote his time to the Mount Horeb Mustard Museum he founded in 1992. In 2000, the growing museum moved to its permanent location in Middleton and became the National Mustard Museum. There you can see 5,624 different mustards and a collection of mustard memorabilia. The museum is open 10 a.m. to 5 p.m. seven days a week. Admission is free, as the museum is supported by donations and mustard sales. The world’s only vinegar museum was founded by Lawrence "Vinegarman" Diggs to showcase the many varieties of vinegar and its many uses. The International Vinegar Museum has 350 different varieties of vinegar, a test kitchen, and vinegar tastings for visitors. The museum is open during the summer only. If you plan to visit Roslyn, the best time would be in June during the International Vinegar Festival. 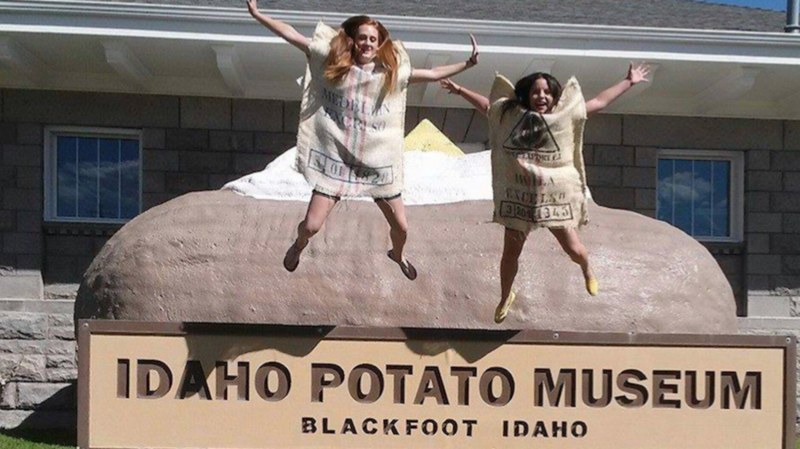 Idaho produces more potatoes than any other state, so it only makes sense that they would have a museum dedicated to the state’s crop. The Idaho Potato Museum is housed in the historic Oregon Short Line Railroad Depot in Blackfoot. You’ll learn about potato history, growing potatoes, and the importance of potatoes to Idaho’s economy. The newest addition to the museum is the Potato Station Cafe, which specialized in French fries, of course. The Idaho Potato Museum is open six days a week from April through September, and weekdays from October through March. Harland Sanders fed travelers at his gas station on Corbin, Kentucky, during the Great Depression, and then opened a restaurant, where he developed his method of pressure-frying chicken, which he breaded with 11 herbs and spices. Kentucky Fried Chicken grew out of that restaurant, which for a time had a motel attached. Sanders set up a sample hotel room inside the restaurant so that travelers could see what the rooms looked like before making the decision to stay. The motel is gone, but that restaurant was restored as the Harland Sanders Cafe and Museum, with many of the original artifacts, including the sample motel room. There is a modern KFC outlet attached. Some of the museum’s artifacts are displayed at the fast food unit, and you can sit down and eat your chicken in the museum. Live news broadcasts can be a gold mine for humor, especially when an animal is involved. Animals really don’t care a bit that you’re broadcasting live to an audience, and the chaos they can cause once that red light is on is simply hilarious. Luckily for us, these broadcasts can live on forever on the internet, especially once they find their way to YouTube. Here are 13 examples of what can happen when an animal goes rogue during live news. Steve Jacobs, from the Australian show TODAY, was broadcasting live from Taronga Zoo in Sydney for an extended segment in 2010. He still had to report on the weather forecast from the remote location, but didn’t get far into it before a pelican bit him on the behind. There’s no way to keep a straight face when that happens. Nicole DiDonato of WXMI was doing a live news tease in July of 2012 when an intrepid cat jumped up on her shoulders. When DiDonato returned to do the full report, the cat was still there and still trying to take her attention away from her job. Cats pay no mind whatsoever to conventions like keeping a studio floor clear during a live broadcast. Univision’s Eduardo Rodriguez was presenting a weather report at WLTV in Miami in 2012 when a cat sashayed across the studio floor. Rodriguez kept his composure and finished his report as the crew cracked up in the background. At WXYZ in Detroit, a stray kitten decided she wanted to get to know reporter Nima Shaffe just a little bit better. The fact that he was on location for a news report made no difference, and the kitten wouldn’t take "no" for an answer. The station went with it and made the report about the kitten. The local Humane Society took the kitten in and planned to put her up for adoption. A reporter from Macedonia TV tried his best to deliver a story on equestrian training, but a horse named Frankie couldn’t contain his curiosity and affection. It makes perfect sense to put a horse in the background for such a report, but this one wasn’t good at following stage directions. You can see the clip here. This interview from a Russian news channel was placed right in front of a donkey enclosure, which, as you'll see, is never a good idea for a coherent broadcast. The lone donkey in the shot was not going to stand idly by when he had the opportunity to address the audience. We’re not sure what he said, but he came off like a real jackass. One early morning in October 2018, reporter Morgan Saxton was shooting a live segment in Utah's Spring Lake when a mysterious creature interrupted the shot. "What you’re seeing is—actually a dog coming into our live shot,” she said nervously. “I think it’s a dog, I’m not sure. Anyway, there’s some sort of creature below me.” Saxton later shared the segment on Twitter, asking what animal her followers thought it was. Some went feline, saying it was a mountain lion; others, however, said it was a dog. Utah Division of Wildlife Resources ultimately determined, based on the animal's tracks, that it was indeed a pupper. Meteorologist Ryan Phillips was delivering the weather report at NBC 6 in Miami in January of 2015. Meanwhile, the broadcast crew was preparing for the upcoming “Pet of the Week” segment, featuring a pet from a local animal shelter, Pooches in Pines. King, an American bulldog, couldn’t wait for his turn in front of the camera and decided to jump up on the news desk to get some extra attention from the weather man. King was soon adopted by his foster family. This past March, Andrea Martinez of KYTX CBS1 9 News was reporting on storm damage in Malakoff, Texas, when a dog on a lawn mower distracted everyone. The dog wasn’t trying to interrupt, but once Martinez saw him, the news crew had to take a closer look. Needless to say, more people saw the dog than would ever see the storm report. In early 2015, meteorologist John Zeigler was doing his report at KOLR 10 in Springfield, Missouri, when his dog Griffey decided it was time to play! Zeigler distracted the dog by tossing a ball, but Griffey knows how to play fetch, so it was a constant struggle to keep the dog off-camera. However, Griffey was such a hit that he became the station’s mascot, complete with legions of fans and his own Facebook page. You are familiar with the way broadcast news blends various graphics into the background of weather reports. 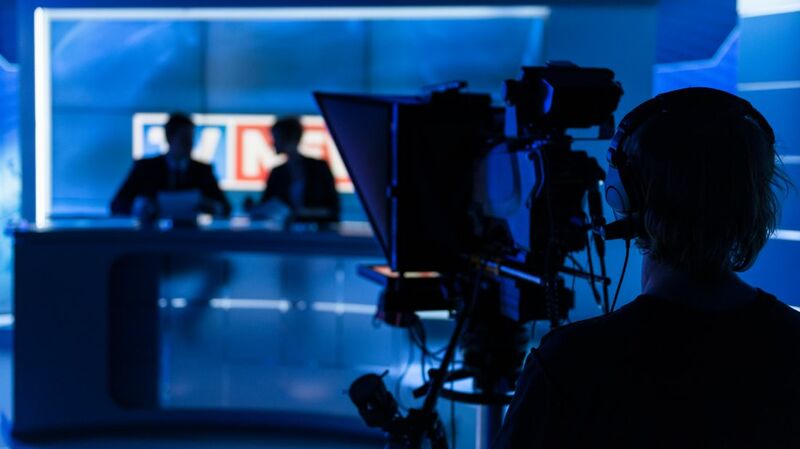 Broadcasters get used to responding to what’s on the air instead of what’s physically in front of them. That response went haywire when a spider landed on the camera lens as Global BC meteorologist Kristi Gordon was giving the weather forecast. She couldn’t help but respond as if the spider were right there with her. STS-122 The space shuttle Atlantis will not launch until the new year. A fuel tank glitch forced mission controllers to delay the launch. And, fuel sensors weren't the only problem. The shuttle was also attacked by a giant spider. But what was even better was what happened when WRDW News 12 reported on the NASA spider. Here’s Meredith Anderson and Tim Strong. Sure, that was a prank, but the video went viral. When KCCI meteorologist Kurtis Gertz did a live report from the Iowa State Fair in 2008, he volunteered to appear in a snake show. A huge Burmese python named Dawn slithered her tail up into the leg of Gertz’s cargo shorts and out the other leg! It took some time to extract her, and even longer for everyone to stop laughing. The video became a classic. 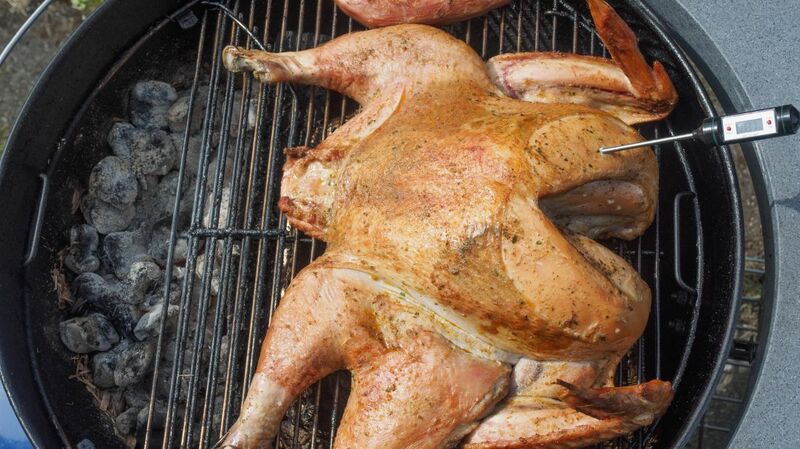 A spatchcocked turkey on a grill. The typical method for preparing a turkey is to put the bird in a hot oven and wait until it's done—perfectly acceptable, if a little basic. Have a more adventurous Thanksgiving this year by trying one of these out-of-the-box recipes. To create this delicious bird, Epicurious recommends marinating the turkey in mole overnight; at minimum, you'll need to coat the inside and the outside of the turkey with the sauce and let it sit in the fridge for an hour before cooking. The chocolate sauce makes for one moist turkey; serve with Masa stuffing and spicy chili gravy on the side. Beer can turkey is a variation on beer can chicken, in which a chicken is propped up over an open can of beer that bastes the bird from the inside. For a turkey, you'll need to find two 24-ounce cans of beer—one for the interior basting, and one for the dripping pan and for basting the outside of the bird—and spices to season. Cooking can be done either in an oven or on the grill; either way, consider purchasing a special rack to help keep the bird upright while it's roasting. Step-by-step instructions can be found at The Chew. J. Kenji Lopez-Alt at Serious Eats calls spatchcocking "a method for lazy folks with great taste," but it's also a great technique if you're short on time. The method—which allows a turkey to cook faster and more evenly—requires removing the bird's spine, turning it over, and pressing hard to splay it out flat before popping it in the oven. You can find step-by-step instructions here. If you're serious about adding alcohol to your turkey, you can emulate New York tavern PD O’Hurley’s by injecting your turkey with vodka. The recipe calls for the turkey to be marinated overnight in four flavors of vodka, and a vodka injection is done after cooking to retain the alcohol content. There's an easy way to make every food better: Add bacon. A turkey is no exception; when placed on top of a turkey, the bacon grease melts and flavors the bird's skin. This recipe combines the flavors of bacon and maple syrup to create one delicious dish. To take the turkey to the next level, check out this recipe, which requires weaving a bacon jacket for your bird. To braise a turkey, you first cook it in the oven, let it rest, then slice it and remove the legs and wings, and cook the meat in broth. It won't look like a traditional Thanksgiving turkey for the presentation, but it will taste delicious. Bobby Flay has a recipe for herb-roasted and braised turkey. Sous-vide is a method for cooking meat that involves encasing meat in a plastic bag and placing it in hot water to cook over a long period of time. Serious Eats has step-by-step instructions for making sous-vide turkey (with crispy skin cooked separately). Before getting down to sous-videing, you'll need to remove the wings and legs from the bird, then cut the breast meat from the bone; next, place one half of the breast meat cut side up, and place the other half on top of it, cut side down, and tie into a cylinder, which is what you'll place into a plastic bag and immerse in a hot water bath for cooking. Pumpkin spice is the ultimate fall flavor—and by following this recipe, you can even have a pumpkin spice-flavored bird. Create one-quarter of a cup of rub with cinnamon, clove, and nutmeg, then add brown sugar, salt, and pepper. Coat the thawed bird with canola oil, then rub in the spice; allow it to sit in the fridge overnight, then cook as usual. Sure, you could make a Turducken—a turkey stuffed with a duck that is stuffed with a chicken—but it's a complicated dish, since all the birds have to be deboned ahead of time. Those who love both Thanksgiving and Dunkin' Donuts should try the Turdunkin', which is "a turkey brined in Dunkin' Donuts coolattas, stuffed with munchkins and served with coffee gravy and mashed hash browns." Yes, it definitely sounds disgusting, but according to one of its creators, "The turDunkin’ was largely delicious" if "a bit too salty ... The coolatta only penetrated the outer reaches of the white meat, but it was delicious and subtle in those places. ... I was very happy with the turkey, the glaze and sprinkles, and the stuffing." You can find step-by-step instructions at Unwholesome Foods. Cook the turkey as you normally would, but replace the stuffing with White Castle sliders (sans pickles). You can find the recipe on White Castle's website, which notes that chefs should "allow 1 Slider for each pound of turkey, which will be equal to 3/4 cup of stuffing per pound."